Your focus is always moving…which way is it going to move? Do you want to be somewhat conscious of this movement? If you do become more conscious, you can claim the greatest power you have as your own. In different moments, your movement of focus may look like any of these choices. Your movement of focus may be towards an action, something to look at or consider, or something to think or affirm mentally. 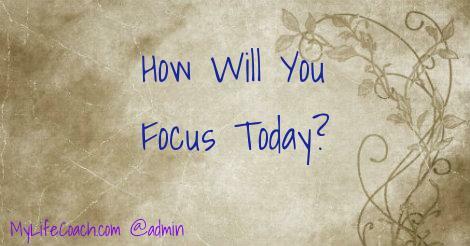 Do you want to focus towards…. More love or less love? More self-acceptance or less self-acceptance? Acceptance of the innate goodness of others or resistance of what is “wrong” with others? Acceptance of your current feeling or resistance of your current feeling? Knowing that you are OK or fear that you are not OK? The wonderfulness of your country or the brokenness of your country? What is going right or what is going wrong? The movement of your focus will be the primary determiner of your effectiveness, health and happiness. How will you move your focus in your moments today?